Online slot machines based on superheroes are always a winner and when they are also one of Playtech’s slots there’s even more to get excited about. Iron Man is the subject of this article and the game is of course based on the 2008 film featuring Robert Downey Jr. as Tony Stark, the eccentric inventor who builds a metallic exoskeleton which transforms him into Iron Man. It’s a five reel and twenty five payline game with a striking red background which reflects the colour of Stark’s bodysuit. The game features Playtech‘s standard 9, 10, J, Q, K and A as the lower value symbols (also tinged with red) but the higher value symbols are all designed with the film in mind. We have two different views of the bodysuit, missiles, a metal case and Tony Stark himself; the bodysuits also act as the wild symbols while the scatter symbols is the Iron Man logo. Reels 2, 3 and 4 of Iron Man contain some stacked wild symbols and if you are lucky enough to land one with all three symbols in view it becomes an expanding wild, giving you some extra opportunities for wins, not too mention a short video clip. Land three Iron Man scatter symbols and a trip to the main bonus game is yours; this is the Missile Attack feature and your task is to shoot down a selection of missiles which will reveal cash prizes, multipliers and free spins. When you’ve finished, the free spins you’ve won will begin with all rewards subject to the multipliers you picked. More free spins can be won indefinitely during the bonus feature by spinning more Iron Man symbols. It’s possible to win cash just by landing two different wild symbols on the same payline and these wins can come as a pleasant surprise it you’re not looking out for them. 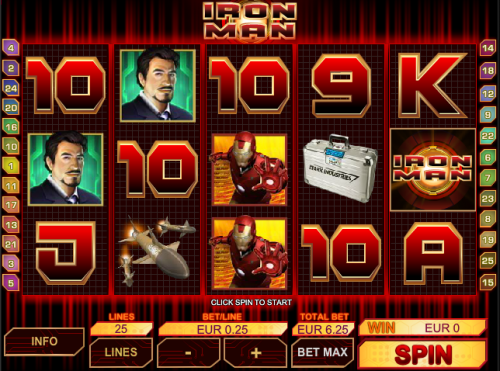 Iron Man maintains the high standards of Playtech’s line of Marvel slots and high and low rollers will appreciate stakes as low as €0.01 for one payline up to €250.00 with everything maxed out.